Cheri Lynn Zemke, 50, of Oconto passed away peacefully with her mother by her side at Rennes Health Care Center – East February 4, 2019. She was born to Eugene and Carol (Purtee) Zemke August 30, 1968 in Racine, WI. 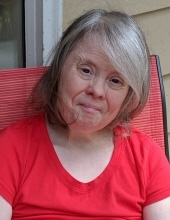 Cheri enjoyed Barbie’s, word search, movies, music, dancing and Special Olympics. Surviving are her mother Carol Zemke and special friend Tom Wheeler, 3 sisters, Dawn Kester and her children, Robert Zemke, Jamie Shoemaker, and Jennifer Kester; Susan Allard and her children, Amanda Zemke, Aaron Bertelsen, Kaitlynn Bertelsen, and Sarah Bertelsen; Kimberly Zemke, 5 nephews, and 2 nieces, and one uncle Ronald Purtee. She was preceded in death by her father Eugene Zemke, great-grandmother Nora White, grand-mother Marie “Nana” Purtee. The family will greet relatives and friends Friday at 1 PM at Okata Manor, 407 Arbutus Ave., Oconto with a Luncheon to follow. Rhodes-Charapata Funeral Home, Oconto is assisting the family. To send flowers or a remembrance gift to the family of Cheri L. Zemke, please visit our Tribute Store. "Email Address" would like to share the life celebration of Cheri L. Zemke. Click on the "link" to go to share a favorite memory or leave a condolence message for the family.